FLIP Flash Album Free 1.3.7710.1 free download. Do not waste any time for searching for the ultimate photo presenting and editing software that's easy to use and affordable. Do not waste any time for searching for the ultimate photo presenting and editing software that's easy to use and affordable. Look no further...FLIP Flash Album, the best 3D page-flipping digital photo application, can help you to pack your favorite photos to a creative and real like flipping digital photo album, then show it to your family and friends. This digital album will be played as a real album with flipping sound when you flip it by mouse. 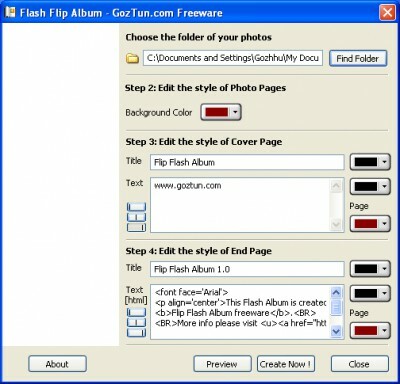 FLIP Flash Album Deluxe aims to be the easiest to use and most powerful tool in this category. You may find many sorts of templates all ready. Just add your photos and select the appropriate template, an attractive photo album can be made so easy. The user-friendly flash photo album creator lets you create flash digital photo albums with photos, descriptions and dynamic Flash effects per page, MP3 music, SWF files and share the photo albums on the net, CDs or via email. DIY CDs, digital magazines and books, Flash slide show and promotion advertising can also be created by this smart software. Auto Photo Renamer is an application that helps you when you need to batch rename photos or files. Web Album Maker is a web photo album creator that helps you create online photo slideshow from your digital photos using unique and highly professional Flash or HTML theme templates. Flash SlideShow Maker is a Flash album creator that will help you build animated photo slideshows with SWF file as the output format. Diji Album Viewer is a Digital Photo Album application that lets you view your personal albums. PPSee is an application for creating picture galleries of photos taken by the digital camera, scanner etc. Net Album Generator is a program that creates photo albums for the web. Umibozu is a web photo album generator, that is highly configurable thanks to its wiki interface! Changes to your album can be made online from anywhere in the world, in just few seconds! Umibozu lets you synchronize a directory tree of photos, and reproduces the hierarchy within the web album. The Master Album Maker Viewer is free software for viewing digital photo albums published by the Master Album Maker in the . With Web Album Generator you can create online photo albums. Photo Album Helper can be used to reduce JPEG images in quality and size. Display and manage your images in a virtual album that lets you browse the images by flipping the pages. Create online photo pages quickly with Redbay's ThumbWizard, the powerful step by step interface helps inexperienced and advanced users to create online photo albums. myVuz is a free, multi-functional and easy to use digital photo management, editing, and publishing application.